An up-to-date addition to the standard cruise text. On May 21, Van Oord christened the fall pipe ship Bravenes on the Holland Amerika Kade in Rotterdam. Submarine rock dumping has been an important activity for Van Oord in the offshore industry for many years. The company has been a market leader in the North Sea area for more than 30 years. A fall pipe ship uses a flexible fall pipe to deposit stone on the bottom of the ocean or a river. The purpose of this is to protect and stabilize structures under water or smoothing the soil. The capacity of the Bravenes is 1800 tons of stone per hour, varying in chunks of 60 to 300 kg. 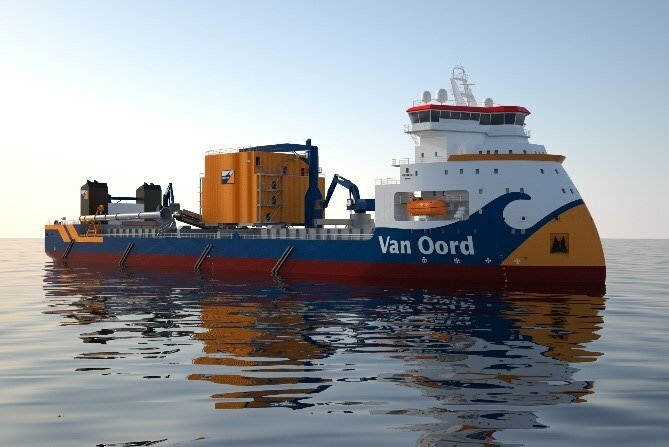 Van Oord has three advanced fall pipe vessels in the fleet. Nordnes, Stornes and the most recent addition Bravenes. The ship, with a carrying capacity of 14,000 tonnes, a length of 154 m and a width of 28 m, is suitable for the installation of stone with various dimensions. The Bravenes can perform three different types of rock dumping operations, namely via a fall pipe through the moon pool, via a fall pipe over the side or via a tremian pipe over the side. Thanks to this third method, the ship can now deposit rock very close to offshore platforms (such as monopiles). The Aegir is a deep water construction vessel of Heerema Marine Contractors from Leiden. 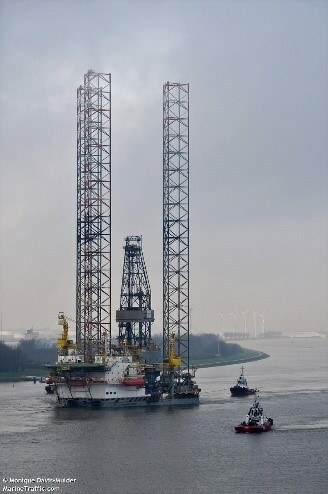 The ship can be used both as a crane ship and pipelayer and is also known as DCV Aegir. Here DCV stands for Deepwater Construction Vessel. The name refers to Ægir, the Norwegian god of seafaring and beer. The Aegir, with a length of 212 meters, is specially designed for the installation of complex infrastructure and pipelines in very deep water. A unique feature of this is that the Aegir can lay pipelines according to both the J-lay and the R-lay method. 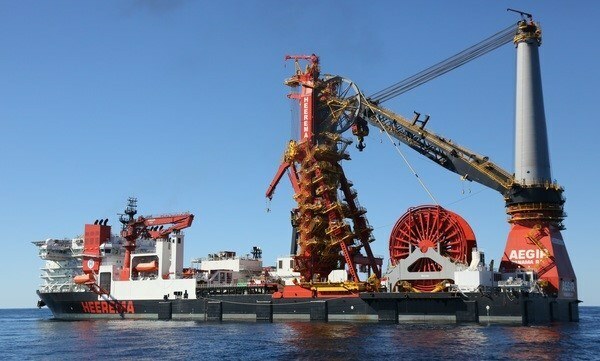 The ship is equipped with a J-lay pipe tower and with two large 2,000 mT coils. This allows pipelines with a diameter of more than 40 cm R-lay to be installed. The large 4,000 mT mast crane has a boom of 125 meters. The crane is suitable both for working at a great depth and for installing fixed platforms and other large constructions in relatively shallow water. The Aegir is a special design, derived from the Ulstein Sea of Solutions SOC 5000 concept. The ship is equipped with Class III DP (dynamic positioning). The Aegir offers accommodation to over 300 crew members and can work at depths up to 3500 meters. Smulders Offshore was responsible for the design, production and assembly of the Stinger, a frame that hangs behind the pipe-laying ship Pioneering Spirit. Pipes are welded together on board the Pioneering Spirit. Via the Stinger transition frame (aboard the Pioneering Spirit) the pipe enters the Stinger and rolls over the 'roller boxes' into the water. The Stinger guides this pipe to the seabed and thus guarantees the most ideal curvature of the welded pipe during the installation phase. The Stinger has a length of 150 meters, a width of 65 meters and a weight of 4,200 tonnes. The Bumblebee is a specially built pontoon for the Stinger of the Pioneering Spirit. In December 2016, Allseas received an order from a Gazprom subsidiary to build 900 kilometres of pipeline for Turkish Stream. The pipeline will be located at a maximum of two kilometers below the sea level at the bottom of the Black Sea. The work lasted a year. In February 2017, Allseas was awarded the contract for the construction of the Nord Stream 2 pipeline in the Baltic Sea. Three pipelayers from Allseas will be used for the assignment, Pioneering Spirit, Solitaire and Audacia. The work will take place in 2018 and 2019. The oil and gas pipelines vary in diameter to a maximum of 63 inches. Rotterdam Offshore Group (ROG) is located at Pier 4 in the Waalhaven. ROG is engaged in the adaptation of offshore equipment. The company has recently expanded its business area; it leases an adjoining site that until recently was used by concrete producer Mebin. 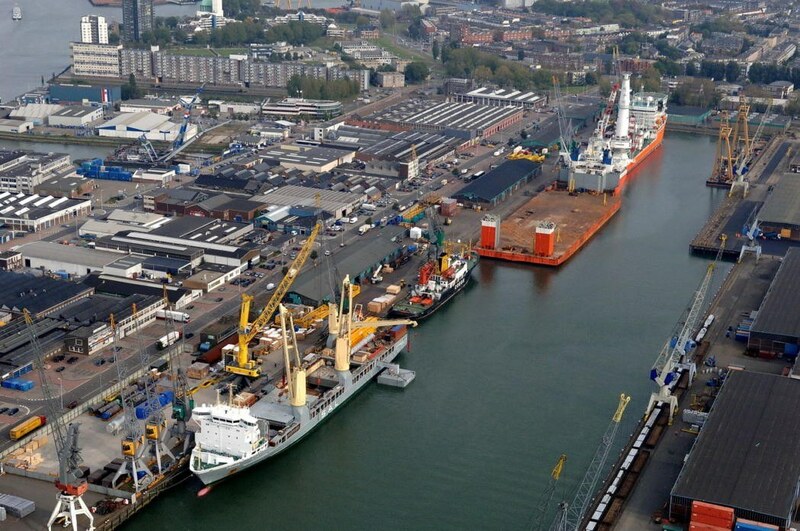 This means that more large offshore installations will pass Schiedam on the Nieuwe Waterweg. The company now has a quay length of 320 meters and an area of more than 22,000 m2 of business premises. 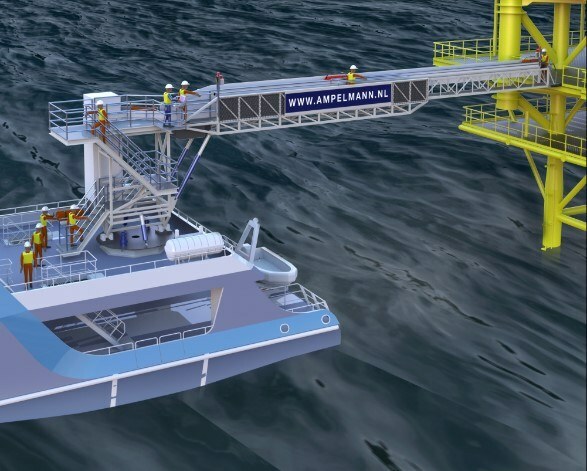 Ampelmann offshore was founded in 2008, as a spin-off from TU Delft. In addition to the head office in Delft, the company has an office in Rotterdam on the RDM site and six foreign offices. Ampelmann develops and builds dynamic systems for transferring personnel and materials from a moving vessel to a drilling platform or wind turbine. A big challenge, given the often bad weather conditions at sea. The system can be compared to a reverse flight simulator. The movements of the ship are measured continuously and then compensated by means of six hydraulic cylinders. The result is a platform that remains perfectly stable despite the movements of the ship. From this stable platform, personnel can safely and efficiently reach the offshore structure via a telescopic walkway. The Ampelmann system is now being embraced by industry-wide. Ampelmann is now known as the world market leader with more than 50 systems, 150 projects and 2.4 million people safely crossed at sea thanks to Ampelmann. The RDM Training Plant is a special public-private project in the heart of the port of Rotterdam. Industry and technology education have realized a 'real life' training facility on the former RDM site, intended for technology students and existing staff in the petrochemical and process industries. By means of lifelike simulations, the RDM Training Plant allows physically and vocational education students to become acquainted with their future workplace and the strict safety culture that goes with it. Existing technicians can also become proficient in the requirements of their profession with sector-specific training courses. At the Training Plant, the private and public literally come together: trainers and trainees come from both business and education. The safety standards that apply to the RDM Training Plant must become the (new) standard for the complex, high-risk environment of the entire process industry as we know it in the Port of Rotterdam. Multinational Franklin Offshore - with headquarters in Singapore - moved its European office to RDM campus since 2012. The company is a specialist in mooring, rigging and equipping offshore vessels and objects. Franklin Offshore Europe - from Dordrecht - will serve the maritime, oil & gas and offshore industry from Rotterdam. The arrival of Franklin Offshore Europe fits in with the Port Company's policy to further strengthen the position of Rotterdam as an offshore port. Moreover, it stimulates the further development of the technical courses at the RDM Campus, of which the Port Authority and the Municipality of Rotterdam, De Hoge School Rotterdam and Albeda College are the major initiators. 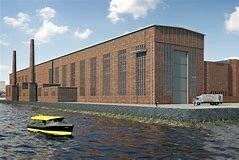 The Scheepsbouwloods on RDM was built at the beginning of the last century and expanded after the Second World War in 1949. A part of Heijplaat has been demolished for this purpose. The warehouse is 28 meters high, 130 meters wide and 280 meters long. Components of legendary ships such as the Nieuw Amsterdam, De Zeven Provinciën and the SS Rotterdam have been built in the warehouse. In the mid-sixties the tide started to turn for the Rotterdam shipbuilding industry and RDM started to focus on the production of reactor vessels, steel constructions and drilling platforms. In 1983 the offshore and maritime industry disappeared from the Heysehaven when RDM closed the Offshore division. In 2002 the Port Authority bought the business park. The shipbuilding hangar has an area of more than 11,000 m2. The boiler factory (first building from 1920) and the coarse forge (first building from 1938) on the east side of the RDM site arose after the extension of the yard in 1918. The buildings were designed for the production and repair of boilers and large-scale machine parts. The Amsterdam architect Herman Ambrosius Jan Baanders (1876-1953) designed the façades of the boiler factory. At that moment he had already designed the main building and the first phase of the garden village Heijplaat. MgAubel makes mineral composites as a sustainable alternative to conventional construction materials. Composites from MgAubel are used for both residential and industrial buildings. MgAubel carries out a pilot project for the Port of Rotterdam Authority, among other things, to examine whether their composite product can be used to repair and reinforce quay walls that are constantly under the influence of waves and salt water. Vertidrive is a company that specializes in the design and production of robots that are used for maintenance on vertical elements in the maritime and petrochemical market. Founded in 1883, is traditionally a player in the field of hoisting and lifting equipment. In recent years, therefore, customers in industry, construction, transport and wind energy were also served. The company is now taking the step to offshore. KWINT was also supplier to shipping in a gray past. Stevedoring company RHB, located at the Waal haven Noordzijde is specialized in the handling and storage of project cargo such as transformers, turbines, windmill equipment such as towers, gondolas, rotor blades, tunnel boring machines, locomotives, dismantled cranes and engines up to a weight of up to 208 tons. The company was founded in 1930. Carousels, turntables, empty or full of cabling, rinsing, relaxing, baskets and connecting cables are also part of the service. The independent offshore terminal is used for the service to offshore vessels during mobilization and demobilization, assembly, repairs or carrying out cleaning of the ship respectively. the equipment. RHB has a quay available with berths over a length of 730 meters for offshore vessels, tankers, breakbulk vessels, Heavy Lift vessels, general cargo vessels, container ships, pontoons and barges. RHB has the heaviest port crane in the world with a lifting capacity of 208 tons. 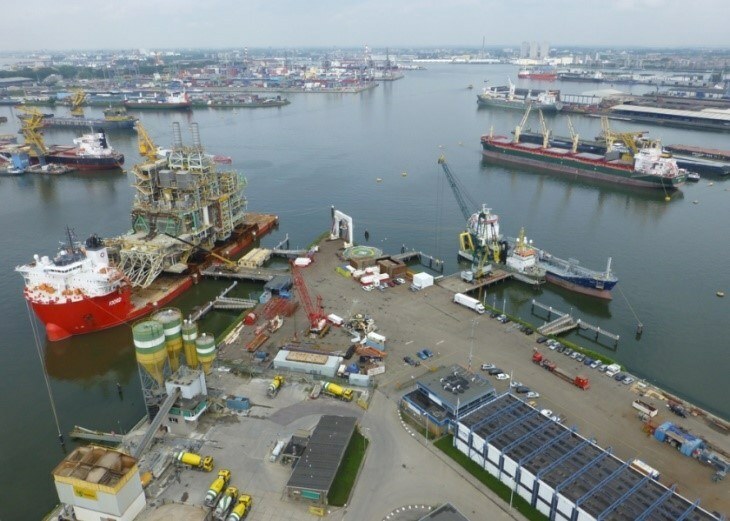 In Rotterdam Heyplaat, Broekman Logistics has an Offshore & Heavy Lift Center that connects directly to a quay that has been specially designed for offshore and heavy lift cargo. The spacious basins of this port ensure that even the largest ships can sail in and out 24 hours a day. This terminal is ideally suited for transporting complex and heavy loads from and to locations in the Netherlands, Germany, Belgium, France, Switzerland and beyond. • Handling all types of heavy and complex cargo. • Saving, assembling, adjusting and securing goods. • Storage (20,000 m² covered and 40,000 m² outside). • Mobilizing and demobilizing all types of ships. • Hoisting with overhead cranes up to 700 tons. The Prospector 5 from Paragon is a drilling platform from the Jack-up class. In the case of the Prospector, this is a three-legged rig. The design is a Freide & Goldman JU2000E, built in 2014 by Shanghai Waigaoqiao Shipyard and sails under the Vanuatuan flag. The legs are designed for a water depth of up to 121.9m (400ft). The Prospector 5 can drill up to 10,666m (35,000ft). The drilling platform has a helideck suitable for the largest helicopters, such as the S-61 and the S-92 and there is accommodation for 140 people.